Scabies is an intensely pruritic skin infestation caused by the host-specific mite Sarcoptes scabiei hominis. A mite causes this common skin condition. Called the human itch mite, this eight-legged bug is so small that cannot see on the skin. People get scabies when the mite burrows into the top layer of skin to live and feed. When the skin reacts to the mite, an extremely itchy rash develops. This mite can travel from the infected person to another person. Most people get scabies from direct, skin-to-skin contact. Less often, people pick up mites from infested items such as bedding, clothes, and furniture. The mite can survive for about 3 to 4 days without being on a human. Anyone can get scabies. Around 300 million cases of scabies are reported worldwide each year. It strikes people of all ages, races, and all levels. People who are very clean and neat can also get scabies. It tends to spread easily in nursing homes and extended-care facilities. After the mite burrows into the skin, it takes time to develop signs and symptoms. 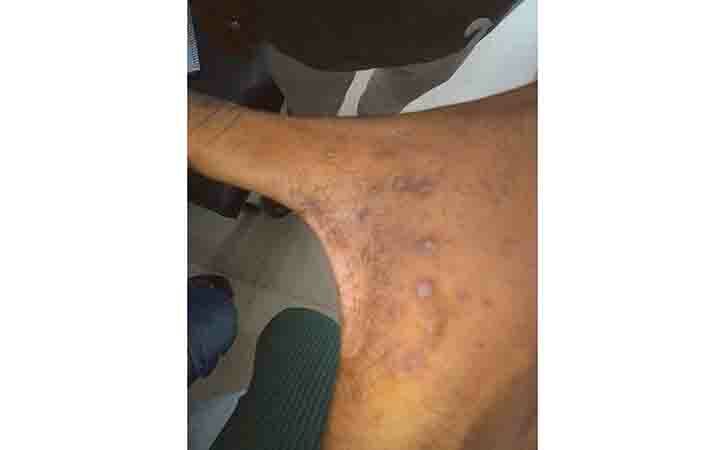 If patient had scabies before, the itching usually begins within 1 to 4 days. When a person has not had scabies, the body needs time to develop a reaction to the mite. It can take 2 to 6 weeks to develop symptoms. In geriatric patients, scabies demonstrates a propensity for the back, often appearing as excoriations. In infants and small children, burrows are commonly located on the palms and soles. One- to 3-mm erythematous papules and vesicles are seen in typical distributions in adults. The vesicles are discrete lesions filled with clear fluid, although the fluid may appear cloudy if the vesicle is more than a few days old. Nodules occur in 7-10% of patients with scabies, particularly young children. In neonates unable to scratch, pinkish brown nodules ranging in size from 2-20 mm in diameter may develop. Also called Norwegian scabies, crusted scabies is a severe form of scabies. In crusted scabies, lesions are often hyperkeratotic and crusted and cover large areas. Marked scaling is common, and pruritus may be minimal or absent. Nail dystrophy and scalp lesions may be prominent. 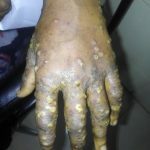 The hands and arms are the usual locations for lesions, but all sites are vulnerable. Thick crusts on the skin: Crusts form when a person develops a severe type of scabies called crusted scabies. Another name for crusted scabies is Norwegian scabies. With so many mites burrowing in the skin, the rash and itch become severe. You’ll find more information about crusted scabies below. Scabies is caused by the host-specific mite Sarcoptes scabiei hominis, an obligate human parasite. Adult mites are 0.3–0.4 mm long. It is a member of the family Sarcoptidae, which belongs to the order Astigmata, in the subclass Acari, class Arachnida. Domestic and wild animals worldwide are susceptible to infestation with Sarcoptes scabiei, and the resultant disease is referred to as sarcoptic mange. Mange due to Sarcoptes scabiei varieties other than hominis has been reported in dogs, pigs, horses, camels, black bears, monkeys, dingoes, and wild foxes, among other animals. It has limited cross-infectivity between different host species. Genotyping studies have revealed that the Sarcoptes mites segregate into separate host-associated populations, thus limiting the transmission across host species. In the rare instance of transmission of nonhuman scabies from animals to humans, the clinical manifestations differ in many respects. The incubation period is shorter, the symptoms are transient, the infestation is self-limiting, no burrows are formed, and the distribution is atypical compared with infestation caused by Sarcoptes scabiei hominis. (1) The patient should wash properly: a hot bath was formerly advocated but it is now known that this may increase absorption through the skin. (2) The lotion should be applied from the neck down, concentrating on affected areas and making sure that the axillae, wrists, ankles, and pubic areas are included. If there is any doubt about the thoroughness of application the process should be repeated in a few days. (3) All contacts and members of the patient’s household should be treated at the same time. (4) Residual papules may persist for many weeks. Topical steroids can be used to relieve the itching. (5) Secondary infection as a result of scratching may need to be treated. Consultation with a doctor is required for severe, refractory scabies or for disseminated scabies in patients who are immunocompromised.